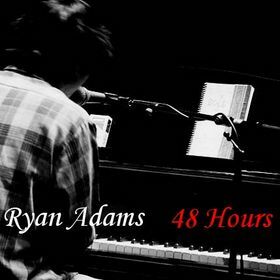 Considering how prolific and unfettered the man is, it’s kind of suprising that there are any songs Ryan Adams hasn’t released. Even in semi-retirement, he still managed to release the double album III/IV, recorded with his Cardinals cohorts, a true clearing house collection if ever there was one (there’s a couple of winners on there, but I’ve probably only listened to the whole thing all the way through twice). The man writes in his sleep, though, so there seems to be a never ending stream of unreleased material, as you can see here (the list is old, so some may have been officially released since). A lot of those songs have made an appearance in concert a few times, but probably plenty of them are classic Ryan clunkers, maybe a nice idea that just never came together. Still, if you know where to look, you can actually find legitimate recordings of some excellent unreleased songs. Albums worth of music were recorded in the early years of his solo career, including 48 Hours and The Suicide Handbook (actually a double album), but were never released. A few of the songs on those albums were later cannibalized and re-recorded for other official releases. But most of the songs never got a proper release, and that’s a shame because some of Ryan’s finest songs are in the bunch. Here are my pick for the top 5 unreleased songs in Ryan Adam’s vast stable. Here’s hoping he gets around to pulling them out for official release. I have this recording in my collection. It sounds like it’s probably a live performance, but it could have just been an intentional low-fi recording (à la “What The Devil Wanted“). Either way makes sense. As is, it sounds like a Whiskeytown b-side, but add a little harmonica in there and this would have been a wonderful addition to the already near perfection that is Heartbreaker. Ryan has never sounded more country. And I don’t mean alt-country. I just mean country. And that, it turns out, is a great thing. Twangy, melancholy and melodic, this is why country music used to be the genre that ‘real men’ listened to, before it became a force of pop sheen and jingoistic propaganda. Forget all that, and just listen. The backing vocals remind me of the best appearances by the Cardinals, which were always about accenting Ryan’s worn but still entrancing voice. If you love Ryan’s Whiskeytown output or his most countrified moments with the Cardinals, this is the hidden gem you need to have in your library. Certainly not treading any new ground, “Idiots” details Ryan’s longing for a girl he’s lost. The thing is, no one writes these kinds of songs better than Ryan, so I’ll gladly take as many as he wants to put out. This is a bit of a strange one from him, though, as it actually sounds like an outtake from Love Is Hell era Ryan, which could be thought of as a dig, but isn’t. At his best, it doesn’t matter what style of music he’s playing because the underlying song works in any genre. The canned drum shuffling in the background is a bit odd, but I love the guitar work in this song and, let’s face it: That’s a great title. Oh, that harmonica. I’m not sure if Ryan gets just how great a weapon that is in his arsenal, but it pretty much automatically makes every song at least 25% better, and here it does not let down. As much as I enjoy Ryan when he’s all broken up about a girl, there’s something special when he mixes in a little more cocky bitterness. This Angelina sounds like a real piece of work, and all the sexier for it. I love the lyrics, I love the swing of the melody and I love the harmonica. Doesn’t get much better than this from Ryan. As you can see, this makes 3 songs on this list from 48 Hours. When they make those lists of unreleased classic albums, it deserves to be on them. I’m convinced if Ryan had released 48 Hours after Heartbreaker (instead of Gold, an album I like just fine), he would have bought himself at least a half decade of good will before the critics started turning on him. Oh well. On a great album, “Karina” is the heartbreaking and stunning climax, a song that (despite no harmonica) hits all the right notes and manages to feel as forlorn as anything on Heartbreaker but with a sturdy resolve that suggests the narrator of “Come Pick Me Up” is finally moving on. I don’t know who Karina is, but I’m in love with her. The Karina (Carina) mentioned is one of my oldest friends, and this song is about such personal events that I couldn’t disclose. But she is another musician, and people fall in love with her from afar for the beautiful lyrics and music she writes. And those of us blessed to know her, love her up close for the walking calamity and beauty/kindness personified that she is. That is some interesting background on one of my favorite RA songs. Thank you.